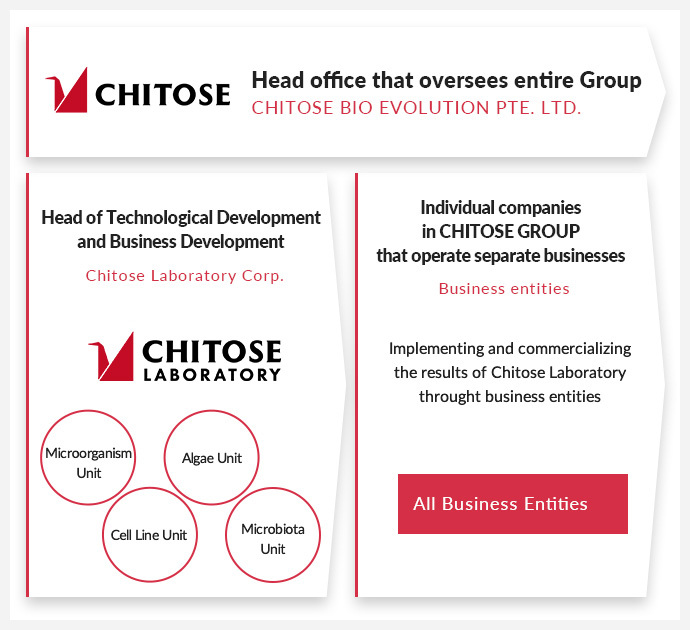 We, CHITOSE GROUP is a family of biotechnology companies operating mainly in Southeast Asia and Japan with an aim of leaving mankind with an environment where they can live in abundance for over a thousand years. CHITOSE GROUP is creating new values in the fields of agriculture, medical, food, energy, chemistry and others through “Technological development capabilities in the biotechnology field by constantly promoting economic rationality” and “Business development capabilities for drawing a path towards commercialization by understanding the essence and limitations of biotechnology”. and Business DevelopmentChitose Laboratory Corp.
Company nameCHITOSE BIO EVOLUTION PTE. LTD.
Business DescriptionFormulating a strategic direction, operating business and financing projects in bio business fields, technological development, business development, financial planning and management, human resource management, and marketing to create business using biotechnology. Business DescriptionWe have been breeding and cultivating technology for a wide range of organisms (microorganisms, cell lines, microalgae etc) and utilize these technologies for industrial use of the organisms. In addition, in cooperation with the subsidiary companies, we conduct new project planning, seed technology construction, practical application technological development, commercialization support and consulting services in the biotechnology field. 2004Microorganism related business started as a new business of Chitose Laboratory Corp. (previously known as Neo-Morgan Laboratory). 2009Tomohiro Fujita carried out MBO of Chitose Laboratory Corp. (previously known as Neo-Morgan Laboratory). 2011Founded Chitose Bio Evolution Pte. Ltd. in Singapore as headquarters. Chitose Laboratory became a subsidiary of CHITOSE GROUP. 2017Chitose Bio Evolution Pte. Ltd. received closed strategic investment (40 million yen) from Mitsui Chemicals, Inc.
Tavelmout Corp. received closed strategic investment (170 million yen) from INCJ, Ltd. and Mitsubishi Corporation.